There will be a Colts’ Presentation and Enrolment Evening in the Pavilion on Thursday 22nd March at 7.00 p.m. with awards, reports and presentations to last season’s outstanding players. All existing Colts are welcome, as well as new ones. If you have any friends, boys or girls, who might be interested, bring them along to the evening. If you were awarded a trophy last year, please return it to Cilla Robertson by 10th February for engraving.
) and a Reed Cricket Club cap (no other cap). In addition, you will need your own Abdo guard, clearly named as with any other personal equipment. All players, who do not have their own helmet, are measured at the start of the season, so that you and your manager can ensure that you wear the correct helmet when batting or wicket keeping. Owing to Reed First XI’s continued success in the Herts Premier Cricket League (Championship) on Saturdays we shall continue with coaching on Sunday mornings this year. The first training session starts on Sunday 22nd APRIL from 10.00 a.m. to 12.00 p.m. and continue until Sunday 22nd July. This year the U15s & U16s will train with the senior club players. Check times on Reed C.C. website. The U11s & U13s will be playing in the Cambridgeshire Youth League. The U9s will play in the Hertfordshire Junior League. U15s & U16s will be playing in the adult (Open-Age) cricket teams on Saturdays and Sundays. A fixture list will be available at the Presentation Evening. Selection for matches depends on commitment to training sessions – the season is short, but intensive. All participants should arrive ten minutes before the start of each training session to be registered. If it is necessary to leave before the end of training, please ensure the Manager is aware of this. Needless to say, colts must stay in the coaching area, as the club cannot be responsible for anyone who wanders off. It is also important your parents collect you punctually at mid-day as most of the coaches leave to play cricket themselves at that time. We are very grateful to the volunteers, who have offered to give up so much time to promote cricket and lead coaching sessions. In addition, all age groups enjoy the benefit of having at least one Level 2 ECB registered coach to train the colts. However, we do expect parents to help with transport to matches and it is also essential that parents volunteer to help out from time to time by umpiring or scoring matches and, if you have time, by supporting on Sunday mornings. Of course, all volunteers who assist with the colts must be DBS checked by the ECB which is a very quick online process. Coaching sessions are open to everyone between the ages of 7 and 15 years, (as of Date of Birth on 1st September 2017). The cost of this year’s membership is £50. This covers all of the colts’ matches and coaching! All participants need to be registered and to have paid the membership fee before coaching commences. There will All Stars Cricket sessions for those aged between 4 and 7 (as of 1st September 2017). This 10-week course will be begin on Sunday 13 May. 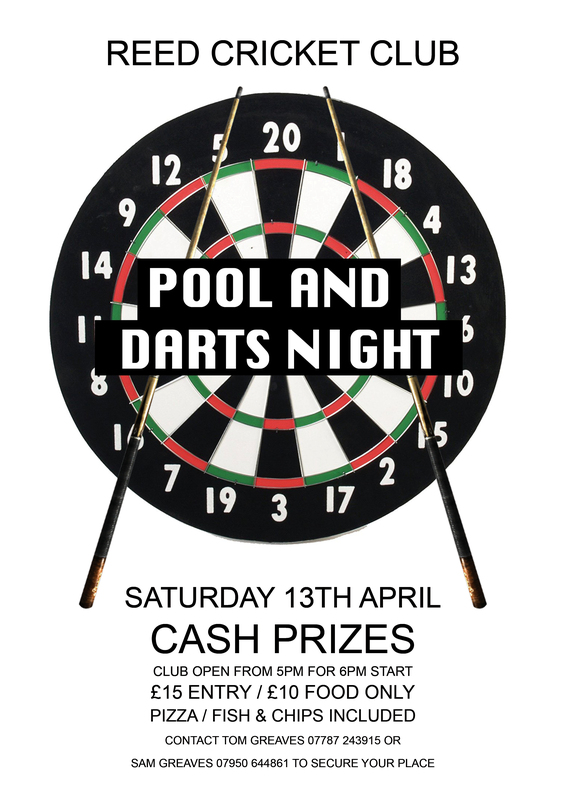 BY POST: Saturday 14th April. Please complete the Membership Form (refer to the ‘Members Area’ heading on the homepage) and return it with £50 (cheques payable to Reed Cricket Club). If there is more than one colt in the family, separate forms must be completed and signed. In order to save postage, it would be appreciated if you could state an e-mail address on the form. We hope to welcome as many of last season’s Colts and their parents as well as new members on Thursday 22nd March. 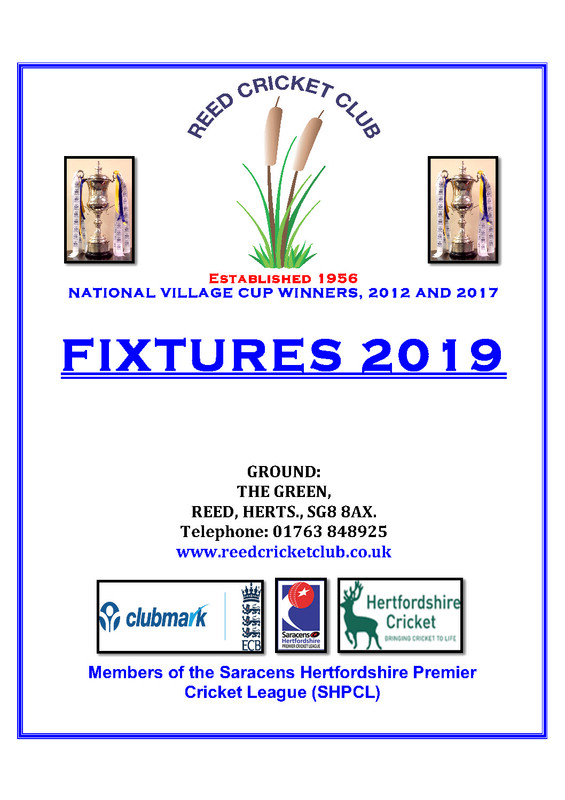 On behalf of Reed Cricket Club, the team managers and coaches, I wish you all an enjoyable season and look forward to seeing you on Sunday mornings. Data protection. 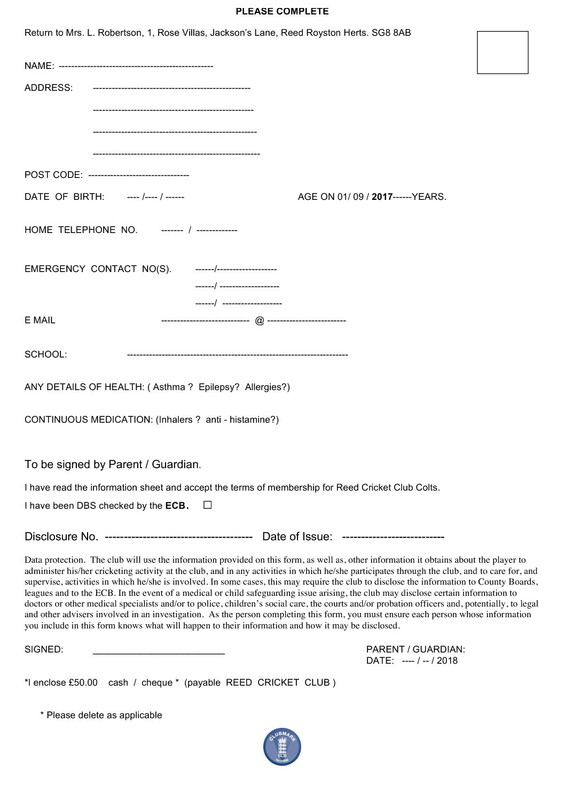 The club will use the information provided on this form, as well as, other information it obtains about the player to administer his/her cricketing activity at the club, and in any activities in which he/she participates through the club, and to care for, and supervise, activities in which he/she is involved. 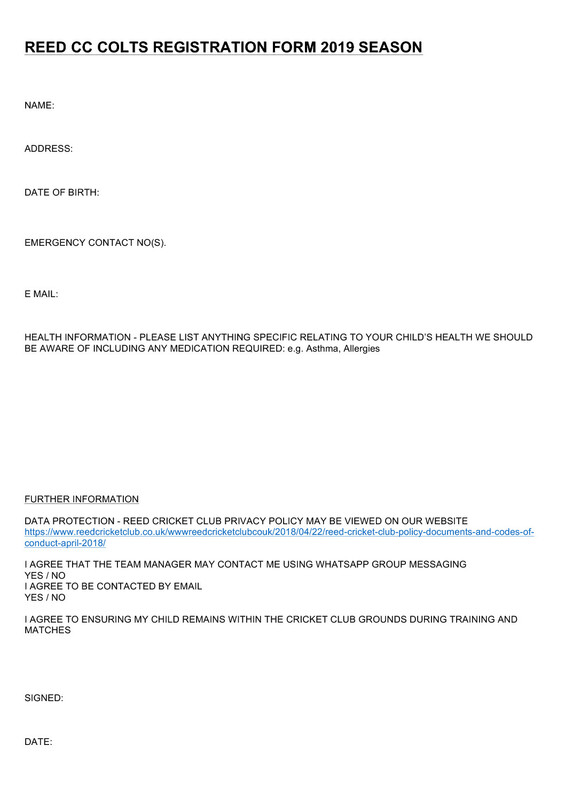 In some cases, this may require the club to disclose the information to County Boards, leagues and to the ECB. In the event of a medical or child safeguarding issue arising, the club may disclose certain information to doctors or other medical specialists and/or to police, children’s social care, the courts and/or probation officers and, potentially, to legal and other advisers involved in an investigation. As the person completing this form, you must ensure each person whose information you include in this form knows what will happen to their information and how it may be disclosed.